I'm a digital stuff modeller. That's how I like to work. When I started to express my feelings and my emotions some years ago (it was 1999) I used all kind of digital software, I am a self-taught artist and I still like to experiment different medium. So I can start with adobe Illustrator and finish a work in painter or flash! I jump between vectors, fonts, shapes and pics! So it's hard to foresee the final results of all my efforts, at the same time I can tell you what kind of style you could find in my works: a mixed of vitriolic sign and angry look for all the world habits! Blanket Magazine the “Music” issue – april 2008 – www.blanketmagazine.com (AUS) limited badge edition with one of my works. 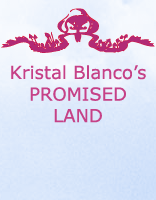 All images copyright © 2008, Kristal Blanco – No unauthorized use.